The concept of near-infrared (NIR) sensitization can be used as an alternative strategy to extend the spectral sensitivity of wide-bandgap polymers in polymer/fullerene solar cells. In ternary systems consisting of a conjugated polymer donor, a fullerene acceptor, and a sensitizer, the fullerene needs to act as an electron acceptor as well as an electron-transport matrix, the polymeric donor should provide a sufficiently high hole mobility, and the sensitizers should sensitize the bulk heterojunction solar cell in the red/NIR region. 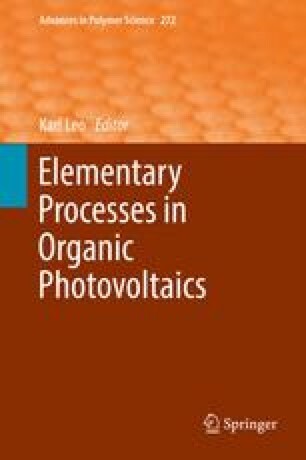 So far we have used various optoelectrical and structural techniques to investigate the possible mechanisms of the charge transfer and charge transport among the three components and microstructure of the ternary blends. In this review-like chapter, we present our recent achievements on developing the concept of NIR sensitization for polymer/fullerene solar cells by mainly addressing the important aspect of the relationship between morphology and transport. This work has been funded by the DFG project (SPP1355), grant numbers. BR 4031/2 − 1 and BR 4031/2-2. T.A and C.J.B. gratefully acknowledge the support of the Cluster of Excellence “Engineering of Advanced Materials” at the University of Erlangen–Nuremberg, which is funded by the German Research Foundation (DFG) within the framework of its “Excellence Initiative” and the project “Solar Technologies Go Hybrid” (SolTech). U.S. and M.F. gratefully acknowledge the support of the DFG project, grant number SCHE 410/23-2.